But now, let's look at the major new features. If you've used the "mask" property of the classic display list, you'll feel right at home with this feature. Just assign any display object to the new "mask" property, as shown below. Any display object can act as a mask, and it may or may not be part of the display list. Those masks are quite fast, since they use the "stencil buffer" of the GPU internally. That means they require two draw calls: one to draw the mask to the stencil buffer, and one to remove it. One limitation that comes with the stencil buffer is that this type of mask it purely binary: either a pixel is visible, or not. E.g. if you replace the Quad of above's sample with an Image, the result won't change: even if the texture contains only transparent pixels, the mask will be rectangular. These classes go hand-in-hand with the mask feature. Since masks rely purely on the geometry, not on any textures, you need a way to draw your mask-shapes. And that's what the Canvas class is for. Do you want to see it live? 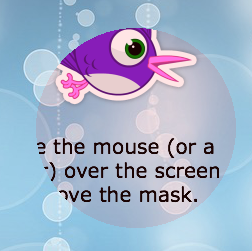 The "Masks" scene of the Starling Demo now uses a circular mask. Finally, here's a pro-tip, if a vector shape just doesn't cut it: I created an extension that allows you to use the alpha channel of a texture as a stencil mask: Texture Mask. Note the last argument of the method, which is a callback. The texture may only be used when that callback has executed. Other than that, it's really straight-forward. To stream a video from a file or URL, you'll need a little bit more code; that's because Flash's "NetStream" API is a little clunky. As always: the full list can be found on GitHub. A huge thanks to all the contributors of this release! Now, again: please let me know what you think about these new features — and try them out in your current projects! If there are any problems or incompatibilities, be sure to let me know. Thanks in advance, guys. I'm looking forward to your posts! Can anybody have an example of a new method Canvas for painting Lines over a photo and quickly save the result as Stencil Masks into a PNG with a transparent background? whoohoo ! will update my game soon to this latest version and will report if I find any issues ! daniel, you rock, big time! Loving the new mask feature. fantastic update list! Thanks so much for all the hard work. I will certainly be doing some testing this week! @Astraport: I'm not sure I understand 100% what you're after, but beware that the "Canvas" class is quite limited right now; e.g. you cannot draw any lines (only fills). If you want to create a PNG, I recommend you do your drawing with the classic Bitmap class. This gives you the full "Graphics" vector arsenal. Awsome, great work as always! cool ! Thanks Daniel !